Trump Cries Fake News - Is Fake Comedy Next? President Trump took another swing at the news media — and more baffling, at entertainment. We are all laughing these days, as well as shaking our heads at those tweets, and the numerous investigations swirling around the President, his administration, and his 2016 campaigns. Must be some joke, yes? 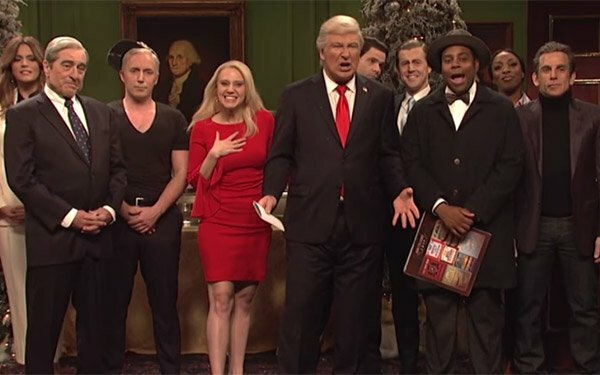 Over the weekend, Trump seemed to be responding to the latest “SNL” parody of the Christmas movie “It’s a Wonderful Life.” It featured a world in which Donald Trump, played by Baldwin, was never elected president. Maybe Trump is interested in some sort of "fairness doctrine” -- abolished by the FCC in 1987 -- where specific “controversial” issues of public importance were required to receive balance coverage. From our point of view, this could mean Trump doing a comedy bit of his own. His resume? Those tweets to start. Trump is obviously a self-effacing politician. (Maybe). He loves a good laugh at his foibles. (Perhaps). Going forward, get ready for Trump to start calling out not just “fake news” but “fake entertainment,” “fake sports,” “fake reality shows” and fake other stuff. In the freer-market, less-regulatory world Trump eventually wants, true TV marketing value can be associated with all kinds of comedy content, as well as other genres. TV advertisers know this. Those highly watched opening Trump skits on “SNL” pull in a lot of TV marketing spending -- some $125.5 million in advertising for the show from December 2017 to December 2018, according to iSpot.tv. This is up from $98.5 million in previous the 12 months. Trump should be happy for TV advertisers. And laughter? Guess that will come later. 1 comment about "Trump Cries Fake News - Is Fake Comedy Next?". Tom Tyler from GCTVTexas, December 19, 2018 at 10:12 p.m. Hundreds of millions of Americans, including myself, haven't watched SNL in decades. And billions of people in the world have ~never~ watched SNL. So, is the laugh on those advertisers who are paying tens of millions in ad bucks, or on we consumers for subsidizing the cost of that advertising through higher prices for goods and services?